GRAVENHURST — What do you get when you combine bright young minds with a new vision and technology? A fresh, new 3D way of looking at your hometown. Gravenhurst High School is receiving a $74,500 grant to digitally animate the town, says a release Tuesday from the Trillium Lakelands District School Board’s Jacki McPherson. On April 12, MPP Norm Miller and the Parry Sound Muskoka Community Network will at GHS to make the official announcement regarding the seed grant of $74,500 from the Ontario Trillium Foundation to support the students’ work on the Minecraft Gravenhurst project. The grant was originally announced last October. 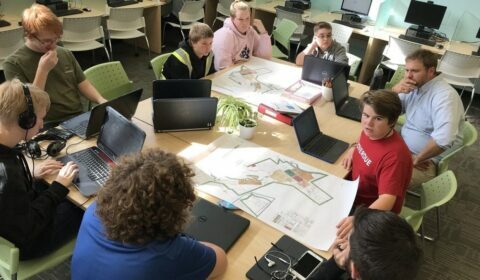 Minecraft Gravenhurst is an initiative where students earn volunteer hours by using the Gravenhurst Archives to digitally animate the historic and current urban design of the Town of Gravenhurst using Minecraft technology. The final product will then be printed using a 3D printer and painted with historical accuracy. The overall goal of the project is to enrich the lives of participants and the members of the public through art, culture, and technology to help preserve and animate the cultural heritage, says the release. The GHS Minecraft project team of students and their teacher has been working on the exciting new project since last fall.